Pia Dreams, USWNT News, and a HollyCornblog Update, Too! Just to keep you up to date … the Red Sox lost and the Phillies won … and there’s nothing from Beulah yet. Rest assured that I’ll post as soon as I see anything! I guess if fitness is an issue for the USWNT in Beijing, we’ll now know who to blame! Congratulations to Kristine Lilly who gave birth to a girl (Sidney) on 7/22 – also Lil’s birthday! A post about The Soccer Girls. Check out the video on the USSF MySpace page. Lots more about settling in for the duration in China! Finally, HollyCornblog has been wicked busy! 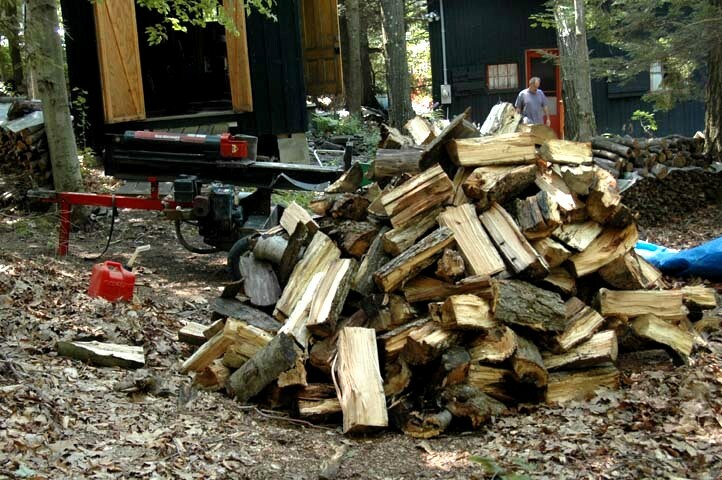 She and CharlieHopbrew rented a wood splitter yesterday and did yeoman’s work on a huge pile of felled wood. Check it out … all split and ready for stacking! This entry was posted in Soccer, etc. and tagged abby, Abby Wambach, april heinrichs, Beijing, Beulah, Carli, Carli Lloyd, CharlieHopbrew, China, Delran, delran nj, Heinrichs, HollyCornblog, Kristine Lilly, Lil, MLD, msnbc, NJ, Norway, Olympic, olympic opener, Philadelphia, Philadelphia Inquirer, Phillies, Pia, Pia Dreams, Pia Sundhage, Red Sox, Sidney, soccer, soccer girls, USSF, USWNT, Wambach, wnt. Bookmark the permalink.